understanding, lifting the burdens for my family." "Cancer Services has been our security blanket through this fearful time." "Cancer Services walks with you every step of the journey." "Cancer Services is like an island of peace in the middle of a tumultuous storm." Cancer Services of Northeast Indiana has been serving people with cancer since 1944. Its service area includes Allen, Adams, DeKalb, Huntington, Kosciusko, LaGrange, Noble, Steuben, Wabash, Wells, and Whitley counties. 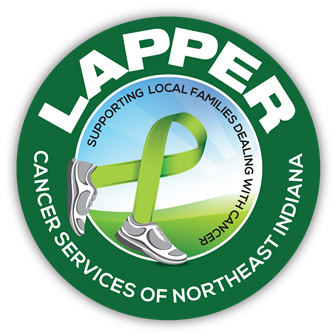 Its mission is to enhance the quality of life of those affected by cancer in Northeast Indiana by providing meaningful resources, information and compassionate assistance. Sign up for Lapper here! Cancer Services is governed by a group of dedicated volunteer board members with a heart for people affected by cancer. Their leadership and guidance enable us to provide the level of care and support that we do for those with cancer and their families in our community. When people with cancer come to Cancer Services, they meet with a Client Advocate, a person who becomes their key resource. The Advocate interacts not only with the cancer patient, but with the entire family, as well. He or she assesses and identifies the full-range of needs for each family, and works with each client on an ongoing basis to assure that those needs continue to be met. Cancer Services mission is to enhance the quality of life of those affected by cancer by providing meaningful resources, information, and compassionate assistance.